The garden dwelling is often the forgotten room of the home; we’re here to assist you, as you create your dream garden which will reflect your individuality and taste. A garden can bring enjoyment to you all year long with a little creativity, you can have a quaint place where people can Sip, Play a Game, Relax, and just Enjoy Life for a while. We take great pride in bringing you a vast selection of unique items to help furnish your indoor garden room and your “En plein air” (Outdoor) dwellings. 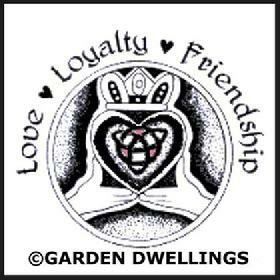 At Garden Dwellings’ we carefully consider, construct, and select items, showcasing a multitude of possibilities and styles, we are always willing to help with custom designs or unearth items for your personal garden dwellings’ and model railway gardens. Let your imagination run wild as you wander our aisles “recycling beautiful memories” of your own. Art Nouveau holds the Decorative Arts to a higher standard and applies these standards to all forms of Art including furniture, textiles, glass, wallpapers, architecture, as well as clothing and jewelry. Stylized organic forms, flora, and fauna were influential in the evolution of Art Nouveau embracing the spirit world, fantasy and myth. 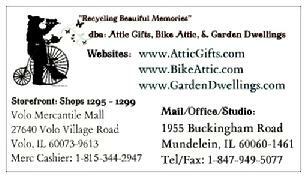 Items in Attic Gifts, bricks-n-mortar store and on our website store are unique and often one-of-a-kind items. 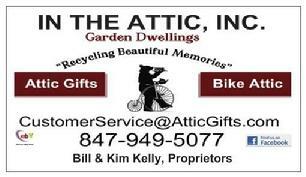 We have patrons who shop 24-hours in our eBay store AtticGifts.com. While we make every attempt to keep our inventory current, it is possible that an item listed will have been previously purchased in our bricks-n-mortar store at Volo-5-Malls; we deeply regret the inconvenience and disappointment this may cause (we do understand this can be frustrating). In the event your item has already been sold, we will inform you and refund your PayPal payment as soon as possible. However, it is our procedure to remove all Auction items from our bricks-n-mortar store during auctions. We thank you in advance for your understanding if this abnormal situation happens caused by the pre-sale of our items.